Kale pesto provides a healthy twist on the Italian classic sauce. Begin cooking some pasta before you start making the pesto. Add the kale, arugula and garlic to a food processor, coarsely chopping to create enough room for the other ingredients. Add the remaining ingredients, from the nuts through the olive oil, and puree until it comes to a nice smooth consistency. Drain the pasta when it is cooked to your liking. Toss the pasta with enough pesto to coat it. Plate the pasta, pass extra cheese and pesto at the table. Substitute 2 to 3 tbsp toasted pumpkin seeds for a nut free recipe. 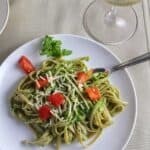 For an updated version of how we’ve been preparing kale pesto lately, along with more recipe ideas, visit this kale pesto overview and roundup.